* Try before you buy MobiLinc Pro! * or our flagship app: MobiLinc HD! * for two devices and two scenes. MobiLinc Featured in National Verizon Commercial over the 2012 Thanksgiving holiday! Imagine touching a single button to turn on all the lights in a dark house before arriving or turn off all of the lights in one easy step on your way to bed. Did you ever wish you could turn on lights from 1,000 miles away while on vacation to make it look like someone is home? Using the Universal Devices ISY 26/99, SmartLinc 2412N, or the PowerLinc INSTEON Controller 2414 and your iPhone/iPod Touch, MobiLinc allows you to command all of the INSTEON and/or X10 lights and devices in your home or office while at home or away. 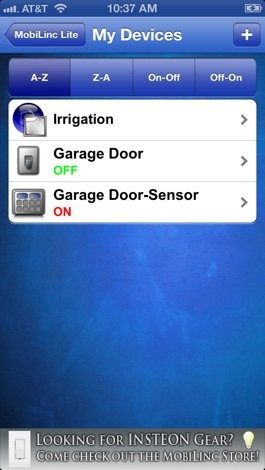 - Tom F. (Volunteer Moderator, Smarthome User-to-User Forums) says: "Great iPhone/iPod Touch interface to the INSTEON/ISY-line of controllers, much easier than using Safari alone! 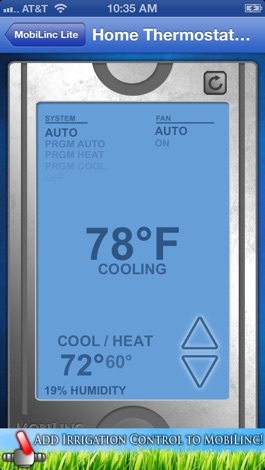 Automatic log-in using your secure connection, easy device and scene control with standard-sized iPhone/iPod Touch controls, real-time device status, hide infrequently used devices or scenes--a must-have!" - Mitchell from Wisconsin says: "I use MobiLinc all the time at home to operate lights and garage door from any location inside or outside the home, but my favorite feature is to be able to turn up the thermostat, from 5 hours away, of my Wisconsin cottage. I can save money by keeping the temperature relatively low to protect the pipes from freezing and limit expansion/contraction damage, yet have the place warm when we arrive, all from the car with the iPhone." MobiLinc Pro or MobiLinc HD. - All ISY Series Controllers from Universal Devices. - SmartLinc 2412N Firmware Version 3.x. - PowerLinc 2414 USB or Serial. 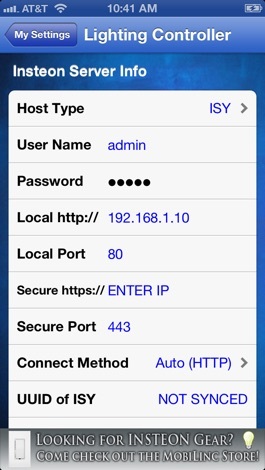 - Wi-Fi auto-discover and easy sync with ISY or SmartLinc to download 2 devices and 2 scenes to MobiLinc. - Realtime device on-level status. 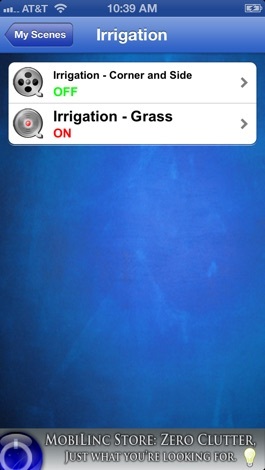 - Turn your INSTEON or X10 Device, and Scene on, off, dim, or brighten. - Supports username and password authentication. - Works over Wi-Fi and cellular. - iPhone/Touch OS 5.0 or later. - Universal Devices ISY Series Controllers (Firmware 2.7.0 and later w/2413S PLM). - SmartLinc Firmware Version 3.x. 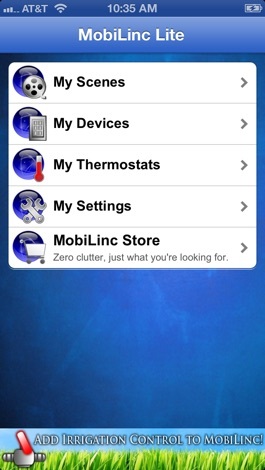 - Please visit: http://mobilinc.com for more information including configuration help and tips. - All screenshots were taken while connected to ISY-994i.